A Law/Gospel refresher course | The Old Adam Lives! If you aren’t too familiar with the Law/Gospel paradigm, this class is a must hear. 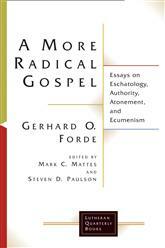 Pastor Mark uses some pages from a Gerhard Forde book (“A More Radical Gospel”) to help us get a better handle on Law/Gospel. And then when we get back to the study of Steven Paulson’s book, it should help us grasp what he is saying to us.